Chickpeas, or garbanzos as they are called in Spain, are very popular in tapas bars. They are usually served in an oval dish surounded by bread triangles that have been fried in olive oil. 1. Fry the garlic and onion in olive oil until softened. Add saffron threads and fry for a further minute. 2. Add the chopped tomatoes and and cook for a further 2-3 minutes to make a thick paste. Add the chickpeas and mix well. 3. Cook spinac in a covered pan without any water for 1-2 minutes until almost tender. 4. 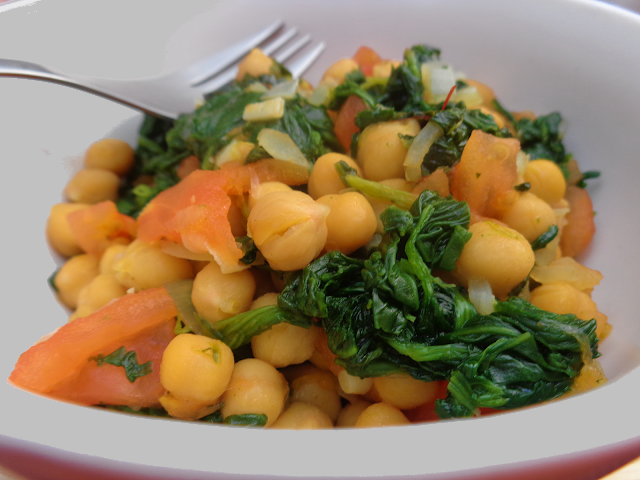 Toss with the chickpeas and spoon into a bowl to serve.